The bright, quiet apartment is 43m ², located in the 1st. OG, has a large room with American kitchen and a small bathroom. The apartment is comfortably furnished, equipped with dining table, wardrobe, a double bed (180x200cm), two single sofa beds with mattress and slatted frame (each, 080x1,95 m) TV, Internet. (Wireless Internet access). The small bathroom of the apartment is tiled and equipped with a shower and a toilet. The American kitchen with fridge, electric cooker and dishwasher invites to self-catering. All important utensils such as dishes, coffee maker, kettle, etc. are available. The apartment also has a washing machine, iron and ironing board. The host is an effective communicator. Questions were quickly answered. The apartment is spacious. An outfitted kitchen is useful and there is a washing machine. per day for your stay in addition to the rental fee. The television uses rabbit ears for reception. Still, the apartment is functional, clean, and comfortable. It was a perfect stay in Berlin. The location of apartment is very central 5 minutes to the metro all shops around - bakery , minimarket , pubs very close. "EXCELLENT, EXCELLENT. 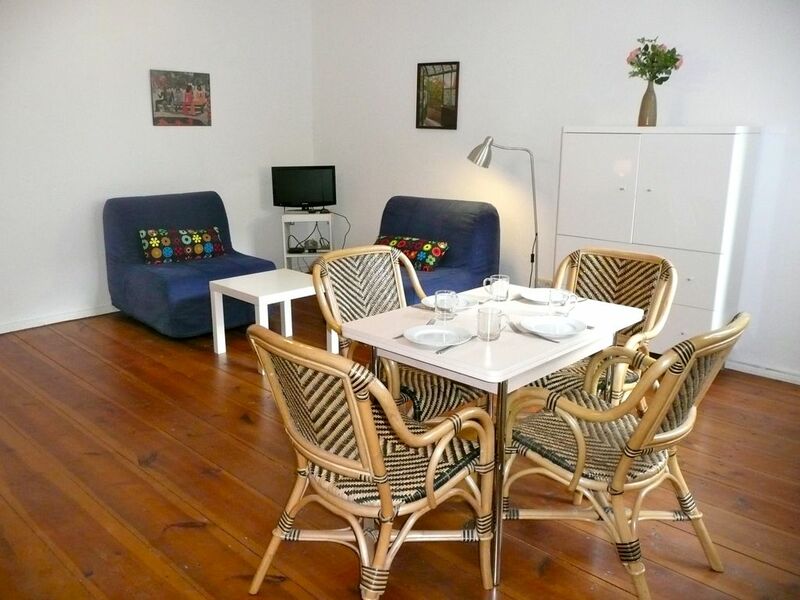 The appartment is in a good area, near the metro and easy to access. The owner is very kind and efficient. The appartment was in an excellent condition, very clear, overlooking the street and has all amenities of house. I'm sure to choose the same place if I comeback to Berlin." Casa come da descrizione, situata in un bel quartiere tranquillo,silenzioso e con tutti i servizi vicino, ottima posizione, in quanto vi sono a pochi centinaia di metri fermate autobus, tram e metropolitana da cui si puo raggiungere ogni parte della citta.Difronte vi è anche un parco dove rilassarsi e far giocare i bambini. Se dobbiamo contestare qualcosa, per quanto ci riguarda, i materassi e cuscini non erano proprio comodi e non cerano le lenzuola, in quanto loro utilizzano solo il coprimaterasso . Scarseggia la biancheria (teli per cucina e asciugamani) noi per 7 giorni abbiamo usato sempre.glistessi asciugamani, e non cera tovaglia . Per il resto tutto ok, consigliata. In Ergänzung zu meiner Bewertung: Die Vermieterin hat dann doch Kulanz gezeigt und mir eine Übernachtung erstattet und versichert die Wohnung zu renovieren die im Link angegeben ist! !Vielen Dank dafür! Il appartamento si trova in una zona molto bella nel cuore di Berlino, facilmente raggiungubule con i mezzi pubblici, ben arredato. La propretaria e' una persona gentilissima e molto disponibile. Abbiamo passato una vacanza perfetta! thank you very much. You have been a really good guest and I hope to accommodate you again. The apartment is located in a popular residential area of ​​Berlin, on a quiet street with lots of trees, near the Rathaus Schöneberg, from whose balcony Kennedy once said the famous phrase:ch bin ein Berliner ". In the nearby Eisenacher Strasse and the Akazienstrasse extending a lively, colorful neighborhood with a diverse bar scene and lots of interesting shops, which gives the area a special charm. Tuesdays and Fridays, there is a colorful weekly market in front of the Schöneberg Town Hall, also on Sundays flea market. 5 minutes away from the apartment starts the People's Park, a popular recreation area of ​​Berlin, which extends over many kilometers.